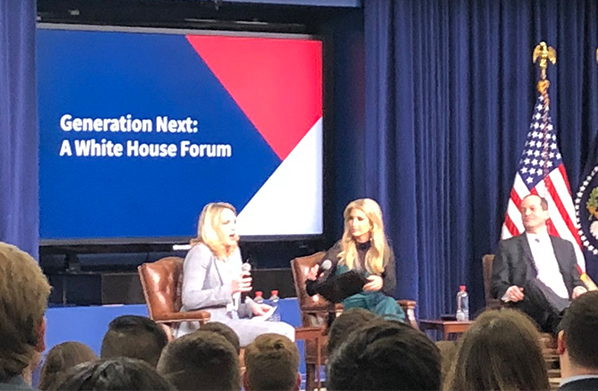 I joined two hundred millennials and millennials leaders at the White House yesterday to hear from President Donald Trump, Ivanka Trump, and several cabinet secretaries and spokespeople about efforts to help this generation. Topics covered include the economy, jobs, workplace issues for families, education, campus free speech, and the opioid crisis. The funniest line of the day came from President Trump who was asked what advice he would give to his 25-year-old self: "Don't run for president!" The room erupted in laughter. Overall, administration officials encouraged young people to consider jobs in the public sector to help to push forward on policies that aim to help them and all Americans. Jobs, jobs, and education that leads to jobs - President Trump, Labor Secretary Alexander Acosta, and advisor Ivanka Trump explained that our strong labor market with 4.1 percent unemployment rate and 6.3 million unfilled jobs is great for young people. Graduating seniors can find jobs, younger workers can leave their jobs and find new ones, workers are experiencing wage growth, and tax cuts allow younger workers to keep more of their paychecks. The administration is also proposing programs that connect education and training with the available jobs (like apprenticeships). They reiterated that they are committed to helping students understand what jobs are available to them when they graduate high school or college as well as the skills needed to get those jobs. Removing barriers to entrepreneurs and jobs - Secretary Acosta talked about the challenges that dog walkers now face in one city where they must now get a license- something that wasn't needed before. The administration wants cities and states to reform their licensing requirements for different jobs (called occupational licensing reform) to increase competition and allow young people to get into jobs, transfer their skills, or start their own businesses. Ivanka Trump highlighted how important this is for military spouses who move around often but can't port their certification across state lines. Fighting the opioid crisis – The administration is working across agencies to implement measures that stop the supply of illegal drugs, get poisonous drugs off the street, rehabilitate those struggling with opioid addiction, educate the public, and push for alternatives to opioids. For example, Sarah Flores of the Department of Justice talked about a federal drug bust this week that took 3 pounds of fentanyl (a synthetic opioid) off the streets which she said is enough to kill all of Toledo, OH. One area that Ivanka Trump iterated her commitment to helping millennial women is on paid leave, but it was Secretary Acosta who explained why this an issue for conservatives to run with. He noted, "This is a conservative principle, we believe in family." 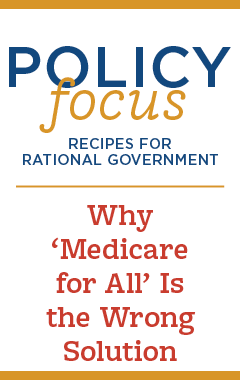 He went on to explain why passing a paid-leave solution ensures women's continuedlabor force attachment and strengthens the modern working family. Millennials today can be encouraged that this is the best economy we've had in decades. Opportunity is abundant, but we need Washington to continue tearing down the hurdles and promoting pro-growth policies to keep us moving forward.